3 Bedroom Semi Detached House For Sale in Uckfield for Offers Over £425,000. 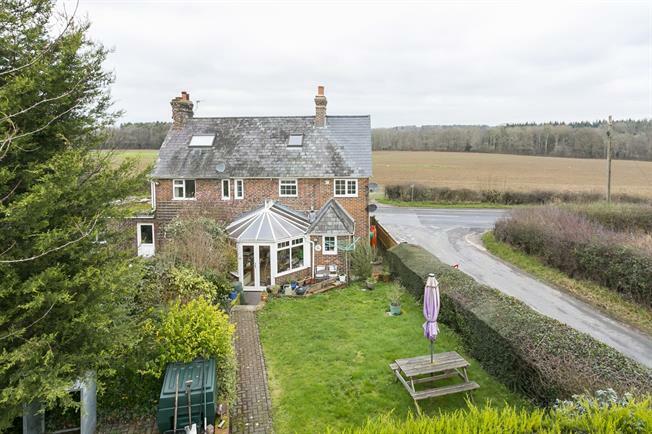 This lovely 3 bedroom country cottage is set in large gardens with the added bonus of an area of paddock to the rear overlooking countryside. Parking area and garage. Full of period charm and character. The cottage has views over the adjoining countryside with the weald footpath close by. Entrance hall, cloakroom, door to the fitted kitchen, door to the spacious sitting room/dining with woodburning stove and opens to the bright conservatory with doors to the gardens and terrace. On the first floor there are two double bedrooms one with an en-suite shower room both with far reaching views and the family bathroom, on the second floor is a large bedroom with adjoining dressing room (possible to convert to ensuite stpp).The pretty cottage gardens to the rear of the property run down to a parking area with timber outbuildings. This area opens to an area of paddock which is fence enclosed.